We’re entering the second week of the Virtual Potluck Tasty and Healthy New Year Challenge featuring products from Bob’s Red Mill and California Olive Ranch. Once a week for the first four weeks of the year, we’ll be pairing a flour or grain with an olive oil and creating a dish using both. Our second course challenge is to create a side dish with Grandé Whole Grains and Miller’s Blend Extra Virgin Olive Oil. You’ll have a chance to win both products, but more on that later. When I first looked at the bag of Grandé Whole Grains, I thought it was primarily brown basmatic rice. It’s really a combination of whole grain wheat, oats, rye, triticale (wheat/rye hybrid), barley, Kamut® (ancient relative of wheat) berries, buckwheat, sesame seeds plus brown rice. The word grandé immediately made me want to go in a Spanish/Mexican direction, so I thought a nice take-off on Spanish rice would be perfect. Let’s just say I should have followed the package directions to see how these grains should be cooked before I decided to freelance. I decided to shift gears entirely and go in a sweeter direction. Thank goodness I did! This stuffing is SO good, you’ll want to eat it with a spoon instead of bothering to stuff the onions. It’s hearty because of the grains and pine nuts, sweet due to the cinnamon and currants and a little bit fruity thanks to the Miller’s Blend olive oil. I had some stuffing leftover after filling the onions and went back after dinner to take a picture. The Grillmaster had devoured the remains while he was cleaning up. “Uh, you didn’t want that for anything, did you?” he asked sheepishly. At least he did the dishes. This recipe originally called for white boiling onions, which I could not find locally. I used regular big ol’ white onions and they were overpowering. 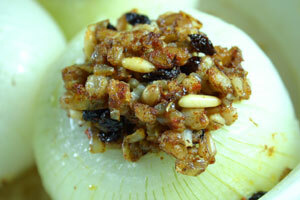 I think I’ll use small sweet onions (such as Vidalias) next time I make this dish. My onions were so large, I could easily have chopped the innards after boiling and used them in the stuffing. I think I’ll try this next time too. If you don’t have any currants, raisins or dried cranberries would work just fine, just be sure to chop them into smaller pieces. This stuffing would be fabulous with pork, chicken and turkey. Or, you could always just eat it with a spoon. [optional] Follow Bob’s Red Mill (@Bobs_Red_Mill), California Olive Ranch (@CA_EVOO) and Virtual Potluck (@virtualpotluck) on Twitter. Tweet about this contest, including a link to this post and the #virtualpotluck hashtag. Then comment here again, letting us know you’ve tweeted. The contest ends at midnight Eastern on Sunday, Jan. 15, 2012. The winner will be announced on Mon., Jan. 16. You must have a U.S. mailing address to win. Good luck! Disclosure: I received free samples of Grandé Whole Grains from Bob’s Red Mill and Miller’s Blend Extra Virgin Olive Oil from California Olive Ranch. I also received samples to give away on my blog. Place grains and water in medium saucepan. Bring to a boil, reduce heat, cover and simmer for about an hour. Check after about 45 minutes to see if you need to add more water. The grains should be somewhat chewy, but should not taste at all raw. Remove from heat. Fill a large pot with water and bring to a boil. 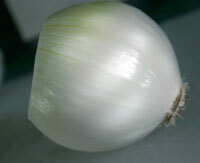 Cut about a half inch off the top of each onion, leaving the root end intact. Peel the onions and trim the roots. Drop the onions and clove into the boiling water and cook about 10 minutes. You want them to soften, but not get mushy. Lift the onions out with tongs or a slotted spoon and put them on a cutting board covered with paper towels. Let them cool while you prepare the stuffing. Reserve about ½ cup of the cooking liquid. Heat 1 tablespoon olive oil in a large saucepan. Sauté minced onion over medium heat for about 4 minutes. Add the salt, cumin, cinnamon and oregano. Cook another 3 to 4 minutes or until the onion is soft and translucent. Add the currants, pine nuts and tomato paste; stir. Add the grains and stir until well combined. When the onions have cooled, use a long-handled teaspoon (the kind you use for actually stirring tea) to dig out the center of each onion. You’ll want to pull out the core and another layer or two, but leave enough of the outer layers to securely hold the stuffing. You want an opening that’s about an inch wide. Fill the middle of each onion with the stuffing mixture and drizzle with more olive oil. Pour the reserved cooking liquid (or water, if you forgot!) into a baking dish and arrange the onions on top. Cover dish with foil and bake for 15-20 minutes. Nutritional Analysis: This recipe is low in Cholesterol and Saturated Fat. It is also a good source of Manganese. Everything tastes better with Miller’s Blend. Entering/Entered giveaways on other blogs. I adore onions, COR, and can’t wait to open my bag of grand grains! I will definitely be trying this recipe along the way! Thanks for sharing and see you at the Potluck! this looks great, I’m glad you used millers blend! What a fun idea Shelby! Love it. Oh Shelby, these look so good, my husband would love them! Miller’s Blend would be perfect with the spicy flavor of Bob’s recipe for Grandé Mexicali. Cheers! Think the Miller’s Blend looks like an intriguing mix of arbequina and arbosana olive oils; good addition to the dish. Your recipe using Miller’s Blend and the Grande Whole Grains Blend is something that I would never think to do, not that I am a master chef. I love the look of it, but I think your right about the use of a sweet onion, at least for someone with my tastebuds. I bet these would be great on the grill. Thanks and Good job! That looks amazing. Definitely trying this weekend! Love the idea of grilling these, a comment from Jeffrey! Miller’s Blend would be a great grain for me. I like the blend of multiple grains and love brown rice! Your recipe sounds delicious. I just made stuffed peppers last weekend. This grain blend would work well with peppers also. I’m thinking you could put the stuffing into both onions and peppers for a variety dish.